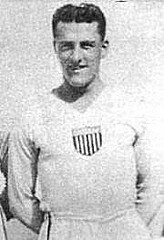 During the first-ever World Cup in 1930, Bert Patenaude scored the first “hat trick” in World Cup history to lead the United States to a third place finish that remains the highest finish ever for the U.S. in one of the most prestigious sporting events in the world. In the first-ever World Cup game for the U.S., Patenaude scored a goal in a 3-0 victory over Belgium. He then scored all three goals in a 3-0 victory over Paraguay. Playing in an era before Sports Center and wall-to-wall coverage, Patenaude was originally credited with the first and third U.S. goals while the second goal was credited to Tom Florie. It was not until 2006 that the second goal was officially given to Patenaude and he was honored as the first player to score three goals in a World Cup game. Originally from Fall River, Massachusetts, Patenaude played professional soccer in the United States from 1928 through 1936. He scored eight goals with the Philadelphia Field Club in 1928. He later played for the Fall River Marksmen and led them to the 1930 U.S. Open Cup. In 1931 he scored five goals in one game and led Fall River to a second straight U.S. Open Cup title. As professional soccer in the United States struggled during the depression, Patenaude played for a number of different teams over the next several years. He was a member of the 1935 Central Breweries team that claimed the U.S. Open Cup. Patenaude was inducted into the U.S. Soccer Hall of Fame in 1971 and passed away in 1974.